The Jesuits Church or Sacred Heart Church located and was completed in 1868 and opened for public worship on January 27, 1869. The architect was William Corbett. and the church is in the parish of St Joseph’s. 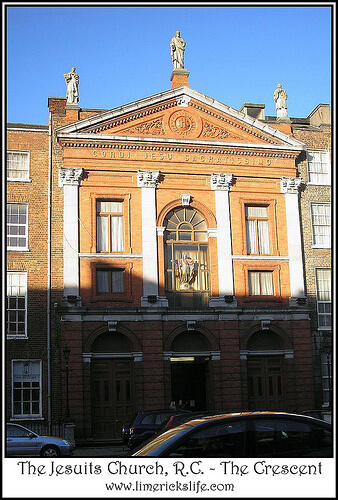 According to some reports, it was originally intended to be dedicated to St. Aloysius but when it was formally dedicated in 1869 it was called the ‘Church of the Sacred Heart’. Dedication of the new church of the Scared Heart, Crescent. 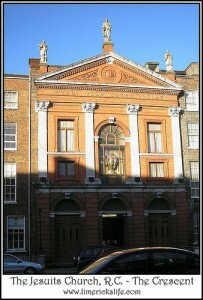 A most numerous and highly respectable congregation in which were many of the leading citizens of Limerick, assembled on Wednesday in the handsome Church which has recently been erected in the Crescent, by the Jesuit Fathers, to witness its opening, and its solemn dedication, according to the Roman Ritual, by the Lord Bishop of Limerick, the Most Rev. Dr. Butler. The occasion was one of very deep interest in a religious point of view; and though the day was unpropitious, the congregation was in all respects such as we have just described it, most numerous and highly respectable. The façade of the church is Classical/Grecian in design and was renovated in 1900. There are no aisles in the church but the nave had two rows of pews. The nave was extended in 1919. The high altar was designed by William Corbett. It is made from 22 types of precious marble. William Corbett was the Limerick City Architect and was integral in the designed Mount Saint Lawrence Cemetery where he was later buried. The Jesuits closed the doors on this building in 2006 and the site was later sold to a private investor. In 2012 the church once again returned into the hands of a religious order.